Hey everyone. I delayed opening today's post in the hope that I'd have some substantive news to share about the defensive coordinator situation. The show must go on, of course, so we're live. I've been covering Tommy Tuberville since he was at Ole Miss (I've been around him since the 98 Egg Bowl) and I've never known him to be so secretive. Even in the situations where he requests certain information be kept out of the papers, Tuberville often will share information. Not this time. He has been remarkably low-profile here. Protocol breaks for a reason. My guess is that he's pursuing someone who doesn't want this dalliance to be known outside his current organization. Regardless, one of the Tigers' biggest recruiting weekends is here and there is no coordinator. I'm surprised. Tuberville and his staff always have their hands full during January weekends with all the prospects in town, so they'll probably have to dial down the search process for a few days. That's if it isn't dialed down already. I have no idea what's going to happen. I'd tell you if I knew. We may not be as flashy as Maurice Jones-Drew, but we are the HOTTEST Auburn blog on the 'net. Not sure what to say about the men's basketball team. Coach Jeff Lebo said he was proud of his team's effort in the Tigers' 76-70 loss to Arkansas on Thursday night. I certainly won't fault the group's effort. Of particular interest to me is guard Frank Tolbert, who give the Tigers an identity. He is the hardest-working Auburn player since Bryant Smith circa 2000. Tolbert dives and slaps and stuffs and hustles all over the place. The problem is that the out-of-control approach that makes him so exciting also makes him an offensive liability. So it goes. They just have to play with nine guys and that's that. Until there are nine useful guys ready to go every night, the true postseason will be out of reach. Nell Fortner can complain about her schedule as much as she wants. How about the men? They opened the SEC season on Thursday night. Now they're on their way to Florida, where they play on Saturday morning. Bogus. Hey everyone. We're still in a holding pattern, as best I can tell, in terms of the defensive coordinator search. My citymate Alan, noted blog commenter, noted in yesterday's comments that LB coach James Willis was being promoted to the top defensive job. That nugget appeared briefly on Charles Goldberg's blog this afternoon. Goldberg since has rescinded that post. I talked with James yesterday. I didn't think to ASK him if he was the new defensive coordinator, though I can't believe that he'll get that job. I think he's a really good coach and a highly valuable recruiter, but he doesn't have much coaching experience. I'll have more as the day progresses. In keeping with tradition: Thanks to all the HOTTIES who make this the HOTTEST Auburn blog on the 'net. *Is there a more overexposed player in America than DeWayne Reed? He needs 10-12 minutes per game. He gets 35. *Auburn has a chance tonight. If they could just get something productive from Matt Heramb. Lucas Hargrove is making some things happen. *Need more Quantez Robertson on offense. More penetration. He's really good off the dribble. *The passing is crisper than I expected. Really good inside-outside passing to get open 3s. So I'm here at the basketball game two hours ahead of time because I wanted to beat the storms out of Montgomery. So while I wait for call-backs that may or may not happen, I decided to hammer out my Top 10 Guitar Hero songs. I know. Like 15 people who read this blog care. At least this will be fun for the 16 of us. Also, I'm ranking these based on how fun they are to play ... not how good the songs are on their own merit. I play on hard most of the time. I prefer medium on one of these, which I note below. Hey everyone. The latest chatter is/was that Western Michigan coach Bill Miller was flying to Auburn this afternoon for an interview. I'm here to tell you that he wasn't in Auburn and, to my knowledge, isn't a candidate for anything aside from "Western Michigan Coach Most Likely to Have His Own Thread On An Auburn Message Board" honors. I went with the Jenna Fischer picture today because it's been too long. She is the official HABOTN Hottie and, as you can see, she at least makes cursory attempts to play Guitar Hero 3. You're welcome. I'll update this more as the day progresses. I'm trying to get some information, though it's been difficult. I think a few of you have noticed. I'm not sure. NOTE TO NEW READERS: I'm joking about how I may not have noticed the HOTTIES' thirst for coordinator news. No need to email me to confirm your interest in knowing who the next coordinator will be. I am aware. Running backs coach Eddie Gran interviewed today with South Alabama officials about the school's top football job. The Jaguars are to field their first team in 2009. 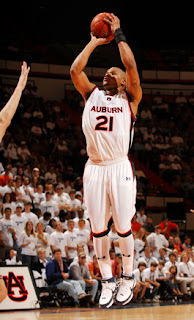 ``It went well," said Gran, who has been at Auburn since the 1999 season. ``There are many people up for the job and I'm excited about the opportunity. It was a great experience." Lots of people are talking with USA about this job, which is weird because that doesn't seem like an appetizing situation to me. Then again, I'm a sports writer in Montgomery. What do I know about coaching? Former Auburn OC Alan Borges is expected to interview for the same position at Ole Miss in the coming days. That's what Parrish Alford at the Northeast Mississippi Daily Journal in Tupelo, Miss., says. I believe him. I don't believe Borges will get that job. Other candidates include ... guys with bigger reputations. Follow the link for more details. UPDATE (@2 p.m.): The big news right now is that DT Pat Sims has elected to forgo his senior season and instead enter the NFL Draft, which first was reported here yesterday. I talked with Mike Detillier, who runs the M&D Draft Report and a guy I love hearing on the radio, and he thinks this could be a really wise decision for Sims. Detillier said LSU's Glenn Dorsey and Southern Cal's Sedrick Ellis are the top two DTs on everyone's list. After that, though, Detillier believes UNC's Kentwan Balmer is next. Sims, though, could move ahead of Balmer into that third choice at DT. ``If Sims works out well and convinces people that this season wasn't a fluke, I can see him going late first round or early second," Detillier said. ``The thought process makes sense. This is not a deep class at defensive tackle. It could be a good situation for Pat." The final polls are out. Auburn finished higher than some expected, though I actually had the team a tad higher than the national average. Others receiving votes: Virginia 66, Penn St. 61, Kentucky 57, Wake Forest 53, Boise St. 25, Arkansas 13, Utah 9, Mississippi St. 7, Appalachian St. 5, South Florida 5, Tulsa 4, Connecticut 3, Air Force 2, Rutgers 2. **I have no idea how Oregon stayed in the poll. Sympathy votes? That team was awful after Dennis Dixon hurt his knee against Arizona. Hey everyone. I was at the Auburn-Xavier game last night and the dunk you see pictured at right ... it was the most vicious, ambitious basketball move I've seen in my entire life. 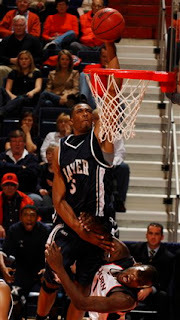 Frank Tolbert got posterized and that's that. "You just have to own up to it," guard Tez Robertson said afterward. The HOTTIES are here for football information, though, so let's move forward. Big up to all the peeps who spend part of their day perusing the HOTTEST Auburn blog on the 'net. We set a record for website traffic last weekend. Thanks for that. I expect DT Pat Sims to announce tomorrow that he will forgo his final year of eligibility for the NFL Draft. I need to leave a little wiggle room on this because I've seen these decisions go 180 degrees in a hurry. 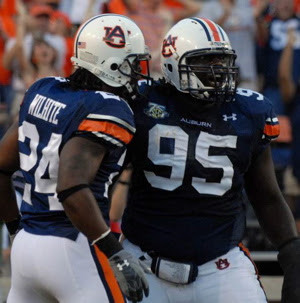 Still, an Auburn player -- one of Sims' best friends -- told me last night that Sims has decided to leave. I'm trying to talk with Sims this afternoon to confirm things. Here's some footage of him owning Les Gators de Florida in 06. UPDATE (@3:20 p.m.): Sims has declined comment. Reserve QB Blake Field's father told the Opelika-Auburn News on Sunday night that his son will transfer to Valdosta State. Field has one season of eligibility remaining. He's one of those guys who deserves another change to plan his career. He didn't get the chance he probably deserved here -- was Brandon Cox really that good? -- and I'm convinced Field could have been a useful player at another school. I hope he plays really well at Valdosta. He deserves a little limelight. In a related note, Columbus, Ga., quarterback commitment Deron Furr told AuburnSports.com Monday that he's planning to sign with Auburn and enroll in school this week. He said Field's decision to transfer accelerated his interest in being with the Tigers for spring drills. Hey everyone. More Muschamp goodness. E-mails still are flooding in from angry Auburn peeps, some of them demanding that Jay Jacobs be held responsible for Will Muschamp's recent decision the leave Texas. That's not a useful remedy. The issues Muschamp had with Auburn's chain of command don't solely rest on Jacobs. He recently learned that the contract he signed in October 2006 wasn't exactly the agreement he'd forged with Jacobs a few months earlier. There was no provision for Muschamp's earnings to be guaranteed if coach Tommy Tuberville was fired. The (significant) people who were directly and indirectly involved with the coup to oust Tuberville in 2003 remain in place. All of them. Had the Tigers lost to Alabama in November, I'm fairly certain a change would have been made at the top. That's about the time Muschamp began examining his contract to make sure he was protected. He wasn't. Jacobs offered to change things after Muschamp learned of the discrepancy. This was before Muschamp talked with Texas. For reasons that I don't fully understand -- and probably never will -- Jacobs' offer didn't give Muschamp much satisfaction. Still, the contract situation isn't what made Muschamp leave. He jetted for a few reasons, though an important one involved his belief that Texas has better esprit de corps. He has been careful to avoid burning bridges. He likes Tuberville. He likes working for Tuberville. He likes Auburn. He just got a better vibe from Texas. **In other news: The men's basketball team lost by 23 points at home to Xavier.